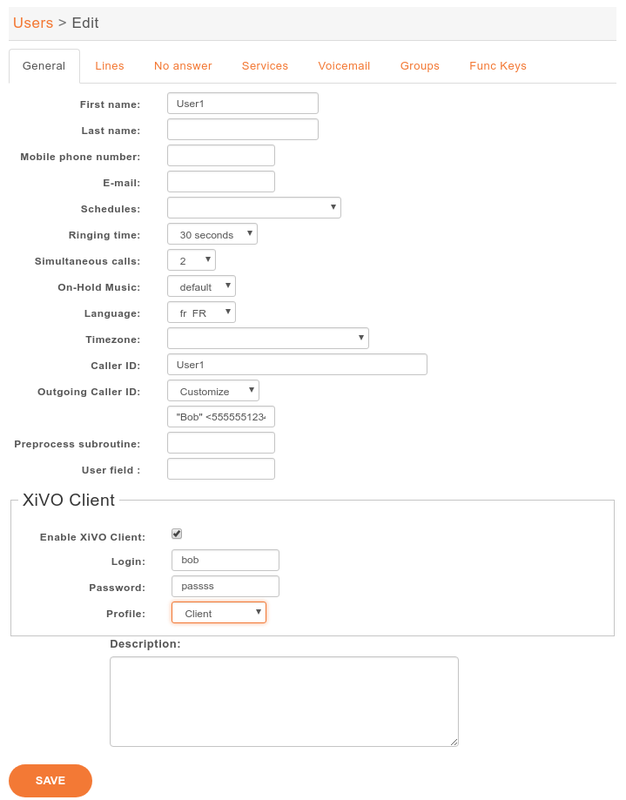 in XiVO PBX Web interface slash “/” character is not supported in the password field. To use your DAHDI links you must create a customized interconnection. R : pick the first available channel in group, going in round-robin fashion (and remembering where it last left off), searching from highest to lowest. group number is the group number to which belongs the span as defined in the /etc/asterisk/dahdi-channels.conf. if you use a BRI card you MUST use per-port dahdi groups. You should not use a group like g0 which spans over several spans. When setting up an interconnection with the public network or another PBX, it is possible to set a caller ID in different places. Each way to configure a caller ID has it’s own use case. 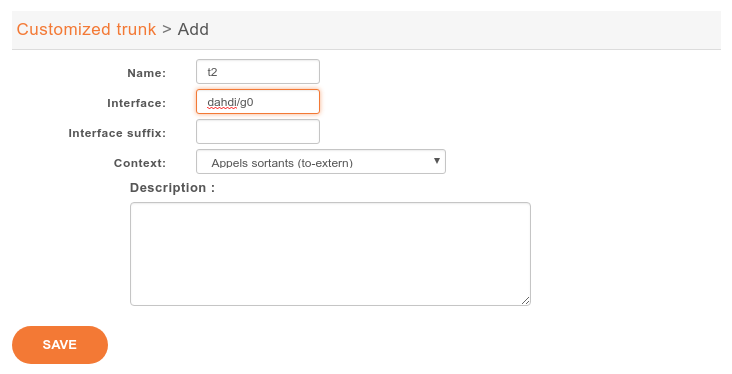 The format for a caller ID is the following "My Name" <9999> If you don’t set the number part of the caller ID, the dialplan’s number will be used instead. This might not be a good option in most cases. If you only need to set a number as an outgoing caller ID, you just have to put the number in the caller ID field like 0123456789. There are several behavior for the outgoing caller ID. When you create an outgoing call, it’s possible to set it to internal, using the check box in the outgoing call configuration menu. When this option is activated, the internal caller’s caller ID will be forwarded to the trunk. This option is useful when the other side of the trunk can reach the user with it’s caller ID number. When the internal caller’s caller ID is not usable to the called party, the outgoing call’s caller id can be fixed to a given value that is more useful to the outside world. Giving the public number here might be a good idea. A user can also have a forced caller ID for outgoing calls. This can be useful for a user who has his own public number (DID number). This option can be set in the user’s configuration page. For this, the Outgoing Caller ID option must be set to Customize. The user can also set his outgoing caller ID to Anonymous. With this option anonymous calls will be sent to your SIP provider with the RFC 3325 standard. Note that in this case, the P-Asserted-Identity SIP Header will contain the Outgoing caller ID number if set. Otherwise it will use the user’s internal caller id, which not a good idea. So you should configure a default caller ID in the outgoing call. The order of precedence when setting the caller ID in multiple places is the following.